NOTE: This is a puzzle cache. The cache is not located at the posted coordinates. The posted coordinates are not correct. However they are about 1 mile away from the correct location. 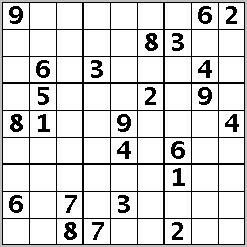 You will need to solve this sudoku puzzle to discover the correct coordinates. The cache container is a 2-liter lock-n-lock, hidden in a wooded area within sight of a walking trail. Be mindful of muggles who might be walking. Kids play nearby so please re-hide the cache well. Thanks! This cache is a successor to "Swamp Thang" (GCVX4P). I was the last person to find the original Swamp Thang before it was taken offline due to muggles. It was such a nicely-done puzzle cache that I felt that its legacy should continue. Although this cache is not nearly as "swampy" as its predecessor, the name was just too good to change.